NEW HOPE, Minn. – Father Terry Rassmussen, pastor of St. Joseph Church in New Hope, finished the reading, closed the Book of the Gospels and stepped away from the ambo. From the congregation, Ginny Untiedt stepped forward. Clad in a white robe, Ms. Untiedt bowed as Father Rassmussen laid his hands on her head and blessed her. She walked to the ambo and began preaching for the last time. He gave the date of his retirement as head of the archdiocese – May 2 – as the time by which parishes should develop “a pastoral plan” to end lay preaching at Mass. Pope Benedict XVI accepted Archbishop Flynn’s resignation on his 75th birthday May 2; 75 is the age at which canon law requires bishops to turn in their resignation. As coadjutor, Archbishop John C. Nienstedt automatically became head of the archdiocese. 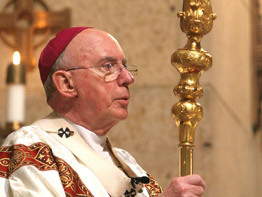 In his January letter to pastors, Archbishop Flynn referenced the 2004 Vatican instruction “Redemptionis Sacramentum,” which called eucharistic lay preaching – a nonordained person reflecting on the Gospel reading at the place in Mass usually reserved for a homily by a priest or deacon – a liturgical abuse. Many lay preachers have expressed “enormous grief and anger” over the archbishop’s directive, said Patricia Hughes Baumer, who co-founded the lay preaching training organization Partners in Preaching with her husband, Fred, in 1997. “To preach the Gospel is an extremely important part of the mission of any priest – I cannot overemphasize its importance,” Archbishop Flynn said. “I would feel deprived, because this is my vocation to preach the Gospel. “And if I were celebrating Mass, and it came time for me to preach – which should be the fruit of my prayer, my experience and the experience of those who (are) in (the) congregation – it would be disruptive to me to have someone else come and break open the word of God,” he said. Ms. Untiedt, 62, also has been preaching for 13 years at St. Joseph and was instrumental in bringing lay preaching to her parish. After Mass May 4, a parishioner told her that he enjoys hearing lay preachers because he can identify with their life experiences, she said. .
Barb Frey, 51, a parishioner at St. Frances Cabrini in Minneapolis, described preaching as a “humbling, transformative experience.” . Lay preachers at St. Frances Cabrini meet almost weekly throughout the year to read, pray and discuss Scripture together. In the last 15 years, the parish has had 52 lay preachers ranging in age from 30 to the mid-70s. They are provided with seven sources of written material to help them plan what to say, and many consult additional sources, said Chris Kosowski, the parish’s liturgist. Some parishes have stopped lay preaching completely. Others were looking for new ways to use their lay preachers. At St. Joseph, lay preachers will reflect on the day’s Scriptures before Mass one Sunday per month. .
Archbishop Nienstedt said he hopes that people will be understanding of the church’s position, but realizes that it might not be easy for them. “It’s awfully hard to explain to somebody why you can’t do something next Sunday that you already did last Sunday,” he said.